The method of inactivation of water-endurable pathogenic microorganisms and viruses by means of ultraviolet (UV) irradiation has proved its effectiveness; in addition, it does not spoil taste and smell of water after treatment and does not bring in water any undesirable by-products. This method is rapidly gaining in popularity as the alternative to conventional reagent techniques. The “SVAROG” Company is the manufacturer of disinfecting units for water treatment in residential and recycling water supply systems, swimming pools, for disinfecting drainage water and purification of sewage. I am bringing to the notice of the readers this paper on practical applications of ultraviolet radiation in disinfecting of the drainage water. The unit for disinfecting of the drainage water described below makes use of UV radiation. Depending on the dose of UV irradiation, either selective (mold, fungi, and bacteria are killed) or complete (viruses along with mold, fungi, and bacteria are killed) disinfection is employed.  Water transparence index (T10). T10 is the per cent of UV radiation remaining after its passing through a water layer of 10 mm in thickness. The lower T10 value, the larger the amount of energy required for disinfection. The lower T10 value, the higher the energy consumption required for disinfection. 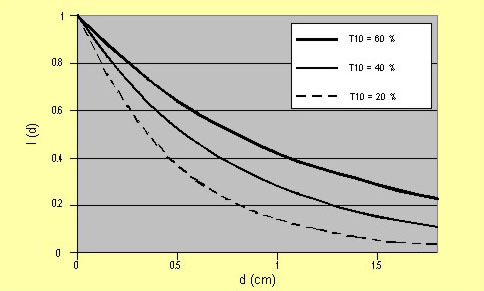 Under growing on a substrate, the value of T10 for the drainage water is as low as 20 - 40%. The drop in T10 for the drainage water is due to the presence of iron chelate and opaque compounds used for plant safeguard. To increase T10 of the drainage water, pure water is added.  The dose of UV irradiation for complete should be no less than 250mJ/cm2. where I is the flux power density, W/см2, and t is time of exposure, s.
The suspension particles that are present in water create shading for radiation and, in addition, transport pathogenic microorganisms. Therefore, sand filters are employed. The average size of sand particles should be 25 (previously, sand filter with average size of particles 78 were employed; however this was found to be ineffective). 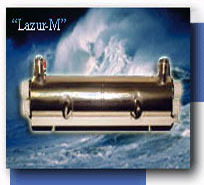 In the course of water purification, the radiative power of lamps and water transparency (T10 value) must be monitored. The plot of effectiveness of water disinfecting by UV irradiation vs. wavelength is presented in Fig. 1. As is seen from Fig. 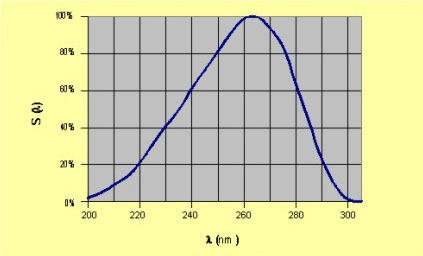 1, the maximum effectiveness is achieved at a wavelength nearby 260 nm. An ultraviolet radiates apparently in all UV spectrum, whereas only the part of spectrum from 200 to 300 nm is actually used in disinfection. Therefore, the lamps are characterized by an effective factor that indicates what part of radiation energy of the lamp is used in disinfection process (see the typical diagram exemplifying the effectiveness of radiation energy distribution in Fig. 2). As follows from this particular example (Fig. 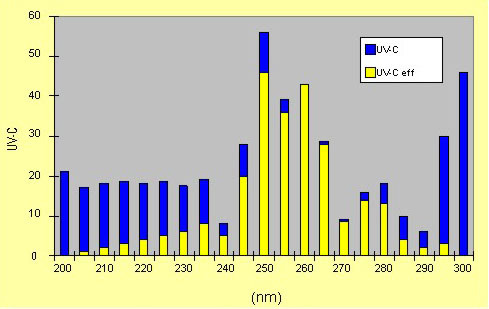 2), the total flux power of light radiation emitted by the lamp is 3 kW; 491 W is the “useful” portion (yellow and blue parts in the diagram), and only 256 W relates to the radiation effective in water disinfection. Thus, the effectiveness factor of the lamp with regard to its disinfecting action depends on its radiation spectrum in this particular case comprises the value of UV –Ceff = 256/3000 = 8.5. In UV water treatment units, it is necessary to provide permanent monitoring of the transparency of treated water using factor T10 (T10 is the percent of UV radiation flux power remaining after passing through a layer of 10 mm in thickness; the flux power must be measured at a wavelength of 253.7 nm.